Every house has one of those places. That place that you put things when you don't know where they ought to go. Things that don't have a home. It is sometimes a junk drawer, a room, a basement, or, in my case, a closet. (Well, actually... the basement is starting to apply to me, but that is a post for another time!) I admire people who can keep the "junk spot" to just a drawer or somewhere small. I am hoping that, with our move to minimalism, my husband and I won't have any need for a "junk spot". That would be the ultimate goal. I am the proud mother of a nearly five month old daughter who refuses to nap! This really limits my time for minimizing projects. I started working on this closet for this week's project and I will finish next week. This closet is used for many things. 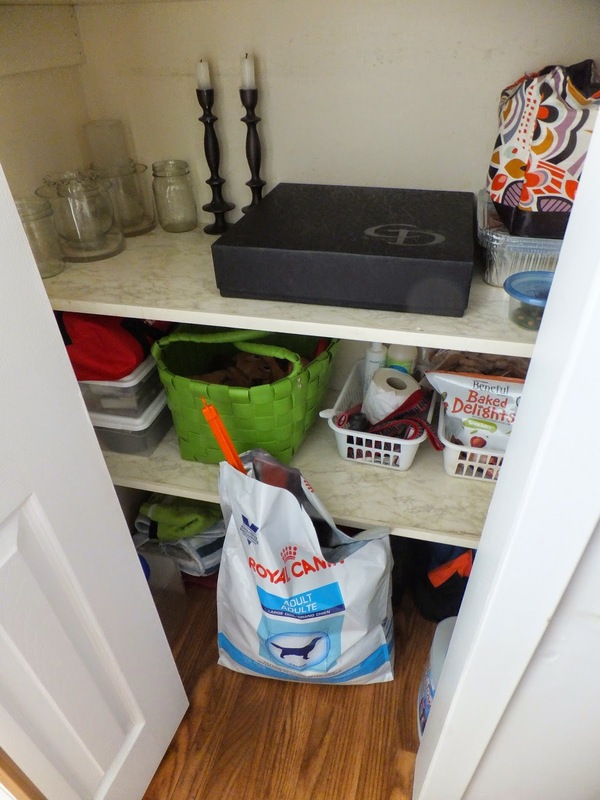 It stores all of our pet supplies, overflow from our tiny kitchen, tools, sewing/craft supplies and many other things. I tackled the floor and first two shelves today. What you can't see is the loads of stuff behind the large bag of dog food. I wasn't really thinking when I took that picture! This closet isn't horrible, but it does cause me to shudder every single time I open it. I can never quite get to what I want and there are a lot of items in the closet that are pure garbage. I started by pulling everything out. I made a bag dedicated to my dog's apparel. She has a winter coat, a Halloween costume (much to my husband's dismay), a life jacket and a few handkerchiefs (for pretty puppy pictures!). I then put her travel dishes into the backpack we always take with us. I sorted through her toys and gave them a designated basket. I folded her towels and stacked them. I then tackled the second shelf. I threw away a lot of items such as: an expired bottled of ear drops for the dog, some expired cat and dog treats, a dog shampoo that doesn't agree with my dog, and a bone that my pup has no interest in. I donated my dogs "winter booties" and one of her hair brushes. The third shelf was easier than I expected. I had room in my kitchen for a few of the items since my husband and I had gone through the kitchen several months ago. I donated a few vases (they really start to pile up!). I also found a home for the phone book (beside the phone, of course!). Ahhhhhhh.... much better! Everything is easier to find and my closet has a lot more space. It is a beautiful thing. 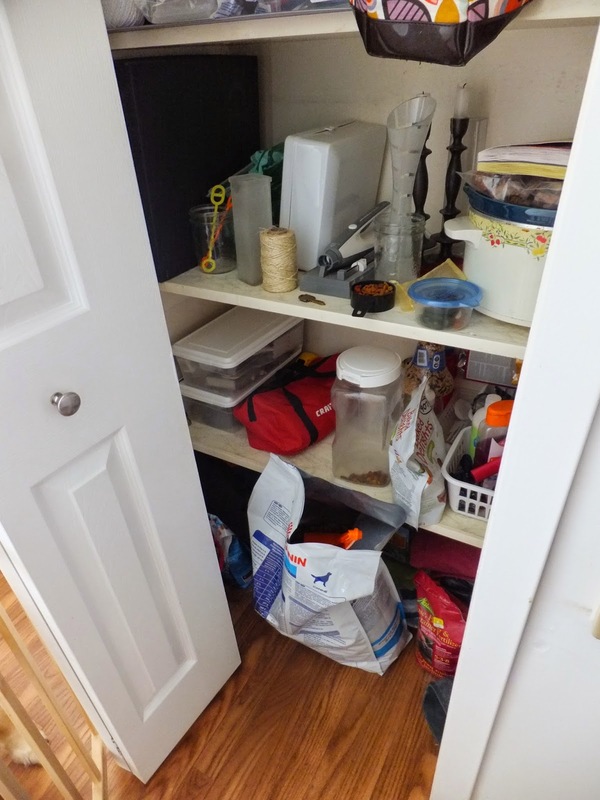 Do you have a junk spot in your house? One of those places that "things" seem to accumulate? What strategies do you use to combat this?